Is it technically a musical? Well, not the kind where people burst into song in the middle of nowhere, but it does have full length performances of original material, and hard rock heavy metal no less. Who couldn’t enjoy that? I think any movie with heavy musical content counts as a musical, so Spinal Tap falls squarely in place. Plus, this is a can’t miss classic anyway, one of the funniest movies of all time and the first of the Christopher Guest “mockumentaries.” Directed by Rob Reiner, and written by Guest and Michael McKean, a documentary crew follows an aging band from the 60’s, Spinal Tap, which has morphed its look and sound with the change of every era in order to stay relevant. The desperation and cluelessness of the band is the joke here, as they can’t accept the reality of being past their prime (ala The Rolling Stones, who managed to last another three decades past the film's release), and just love rockin' out too much to let it go. All the clichés of bands are mocked, from the interfering girlfriend to the doomed fate of the drummer, to the high concept art of overproduced and pretentious stage productions. Easily watched over and over again for the jokes you missed the first time around, Spinal Tap never gets old, no matter how many years go by since the height of the classic rock age. Let’s turn it up to 11, shall we? No matter how many times I see it, it never fails to put a smile on my face. You know the story of course. The inimitable Julie Andrews is Maria, the singing nun from the abbey who becomes the world’s most wonderful nanny (well, second only to Mary Poppins, I suppose) for the seven children of Captain Von Trapp. She then turns them into a singing group that captures the heart of millions. Many millions in fact, as The Sound of Music quickly became one of the most popular movies ever made. I suspect it had less to do with those adorable kids and more with the shining, perky wholesomeness of Julie herself, whose Maria Von Trapp became her defining role and enshrined the image of her spinning on an Austrian mountaintop in moviegoer’s minds forever after (spawning thousands of pageboy haircuts along the way). Dissed by critics as cheesy when first released, audiences embraced it fully, and it ended up winning 6 Oscars in 1965, including Best Picture and Best Director. The songs are emblazoned in your memory, including the title tune, “Do Re Mi”, “Climb Every Mountain”, “Adelweiss”, “My Favorite Things”, and my personal favorite, “The Lonely Goatherd." Fine, maybe the movie itself is a little cheesy, but sometimes cheese works. I dare you to find yourself NOT swooning for the tender romance between Maria and the Captain, or rooting for the Von Trapps to escape from the Nazis to Switzerland, even as your coldly cynical heart will tell you that there’s no way a group of 9 people with small children can survive what’s bound to be a months long journey through the wilderness on foot with no food, water, or weapons of any kind (and the movie tries to fool you that it’s a happy ending, tsk tsk). Despite it all, Maria will find a way to make it through, because that’s just what she does- you know she'll end up forging some kind of makeshift shelter out of tree branches and acorns, and all to the hum of a merry little tune. In 2001, when this movie came out, the musical had essentially been dead as a genre for almost two decades. There may have been the occasional oddity released in the 80’s, but throughout the entire 90’s the only mainstream musicals in existence were the animated Disney ones. Then, Baz Luhrmann came along and reinvented the movie musical singlehandedly for a new millennium, and I don’t think it’s an exaggeration to say so. After Moulin Rouge! came Chicago, Hairspray, Sweeney Todd, Dreamgirls, the High School Musical phenomenon, and Glee (which could never have existed without Moulin Rouge!). Even when they flopped (Nine, The Producers), the point was that the movie musical was alive and kicking, after lying dormant for so many years. In truth, audiences hadn’t outgrown the concept, studios had just forgotten how to make them. What Moulin Rouge did (aside from launching Nicole Kidman into superstardom) was to take pop songs that everyone already knew, combine them into mash-ups with flashy MTV style editing, and relaunch the genre completely so that the story was no longer interrupted by songs, but the constant songs seemed more to be interrupted by the story. Indeed, there’s not much to the story in this one: Ewan MacGregor is a poor writer in France at the turn of the 20th century who falls in love with Nicole, a dying courtesan forced to seduce a rich duke for his money. But that’s all the setup we need for a visually stunning display of imaginative contemporary musical extravaganza, brought to us at a breakneck and breathtaking pace. Another precedent this movie set was to get rid of all dubbing. From now on actors would have to do their own singing onscreen, which wasn’t always a good thing (see Chicago), but in this one it’s perfect. Kidman and especially MacGregor have fantastic voices and could have pursued their own music careers. The concept of anachronistic contemporary music settings would be followed again as well, from A Knight’s Tale to Marie Antoinette. But as influential as it ultimately was, Moulin Rouge still towers over its many impersonators, a tribute to the daring creativity of Baz Luhrmann. Let’s hope he finds the spark to top himself again one day, as only he could. It’s hard to exaggerate just how big the Beatles were in 1964, at the precise moment this film was made. At the time, a lot of pop stars made cheap, Elvis-type B-movies quickly, in order to cash in on the moment before the bubble inevitably burst. Fortunately for The Beatles and us however, it never did. Now, A Hard Day’s Night is a fascinating time capsule from the era, the exact height of Beatlemania across the world. And their first film, the thing to do to cash in, turned out to be much better than a cheaply made rock and roll film, it turned out to be the predecessor for both the music video and the rock documentary. Filmed in striking black and white cinematography that in retrospect accentuated their iconic status, as if director Richard Lester knew at the time how history would look back on them. All the Beatle's personalities are fully formed: John the sharp one, Paul the cute one, George the everyman, and Ringo the goof. It’s a day in the life of the Fab 4, as they are rushed from one performance to another, harassed by frazzled managers, and chased on every street corner by screaming fangirls. Tossing aside quirky one liners and looking like they’re having the time of their lives, the boys are naturals on camera, and the screaming fans' delight can't help but be shared by the audience. And did I mention the music? Every so often the boys break out into a song from the legendary AHDN album, in scenes that really do pave the way for the music videos of the decades to follow. A slice of the pure chaotic joy that really must have been the Beatles’ lives in 1964, you’ll feel like wishing you were there to be a part of the whole scene, and thanking your lucky stars that somebody was to film it. The greatest Disney movie ever made? Hmmm, that’s a tough one. You’re always going to have advocates for Snow White, Pinocchio, the real classic Golden Age stuff, and maybe they’re right. Maybe golden age Disney can’t be topped. But if you ask me, Beauty and the Beast comes awfully close and that’s high praise indeed. At the time, the only animated film ever to be nominated for Best Picture (a record that stood for 17 years), it’s still a beautifully enchanting fairy tale, filling every corner of the screen with magic and music of the highest order. The modern renaissance of the Disney studios began with 1989’s The Little Mermaid, and was transcended just two years later with Beauty and the Beast, still perhaps the peak of their success, although they would go on to have even bigger box office hits. The music had always been a marker of the great Disney films of the past, but the difference now was their being formulated with splashy production numbers filtered into the story, reminiscent of the structure of a Broadway play. Not surprisingly, from now on nearly every new Disney film would go on to become a successful Broadway production. Composers Howard Ashman and Alan Menken were the engineers of the new strategy, and their instincts produced spectacular results. Beauty and the Beast in particular was the one that managed to adapt a world renowned fairy tale into an instant classic, combining a timeless message about the nature of true beauty with thrilling adventure, a feisty heroine, a truly evil villain, heroic sidekicks and a glorious score. Not to be missed. If you’ve never heard of Busby Berkeley, you’ve no doubt seen his work. You just don’t know it. One of the most famous choreographers of all time, his stuff has been seen and spoofed for decades, originally appearing in the earliest musicals ever made, like 42nd Street. Trust me, you’ll know it when you see it. This was the best of the Berkeley musicals (although some prefer Gold Diggers of 1933), the original “backstage drama.” All the elements of the formula spring from here. You’ve got the manic director stressing out over putting the show together (the excellent Warner Baxter), the vain diva who’s the star of the theater, the sleazy show backer who threatens to withdraw funds if his demands aren’t met, and the young ingénue who steps up at the last minute to rescue the show. Enjoyable from beginning to end, the big finale is a 15 minute showstopper featuring the title tune and the amazing Berkeley staged production numbers. It’s also fairly dark for a musical, as many films were in this time period, exploring the moody and depressed sensibility of America’s attitude during the early days of the Great Depression. One heads up about this flick though: Ruby Keeler is the new kid who comes in to save the day, and she instantly became notorious for her inability to either act or sing. She does a nice tap dance, but was otherwise bafflingly untalented. It was noticed in the industry, as she never had another starring role again, reduced to bit supporting parts in favor of people who could actually act. But it’s a fascinating novelty to look back on now, as the irony of her being the best of the bunch tends to mesh perfectly with the cynical undertones apparent throughout. The ending shot is darkly ponderous to this day. The great, splashy MGM musicals of the 1950’s tend to be what people think of when they think “great American musicals.” There was Gigi, An American in Paris, Singin’ in the Rain, all some of the very best ever made. My personal favorite though, would have to be The Band Wagon, although it’s sort of the counterpart to Singin’ in the Rain. One is about the behind the scenes goings on of the movie industry, the other the behind the scenes drama of the theater. In fact, you can’t go wrong with either of them, but since The Band Wagon tends to be less universally known, I’ll throw my weight behind this one. Fred Astaire was one of the greatest performers of all time, a world class dancer who has never been matched in show business even today. He had a playful, carefree attitude regarding everything around him, you couldn’t help being amused by his own always amused demeanor. Here he plays with his offscreen persona at the time, an over the hill, once famous Hollywood actor who attempts a comeback on the stage. The movie has fun with the pretensions of theater people, the supporting characters all variations of the classic archetypes. Cyd Charisse is his partner in this one, a ballerina who made her debut in the famous cameo appearance of Gene Kelly’s dance fantasy from Singin' in the Rain. 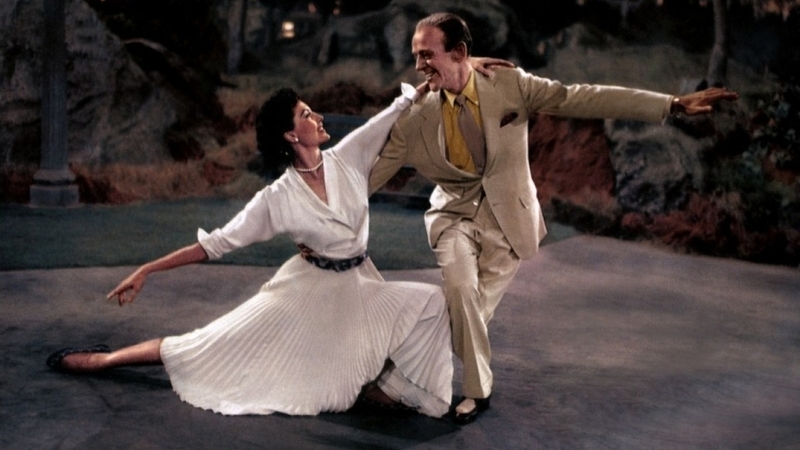 Although a little tall for Astaire (as noted onscreen), she was as graceful and lovely a partner as he ever had. Their first dance together in the moonlit outdoors of Central Park (really one of MGM’s studio backlots) is a haunting and unforgettable movie moment destined to leave you breathless. The music is great too, with “That’s Entertainment” as the central tune, appropriate for the pure joy the movie provides from beginning to end. With Vincente Minnelli such a surehand at musicals, having directed some of the greatest (Meet Me in St. Louis, An American in Paris, later Gigi), and Fred Astaire being the master choreographer and dancer that he was, you just knew going into it you were in the hands of the pros. They sure made it look easy. (Watch for the ending production number, the original inspiration for the famous Michael Jackson “Smooth Criminal” video. It’s another magic moment in a film full of them). Rarely does a movie convey so beautifully the joy of music. Of the process (playing, recording, singing) and everything it can be to a person’s life. Set in Dublin, Ireland, and shot on a tiny budget, this little indie managed to become a pure celebration of the meaning of music to people who have precious little else in life. Starring two unknowns who weren’t even actors and remained nameless throughout the film, they were struggling musicians who met and connected through a shared love of song. Glen Hansard (of the Irish band The Flames) was the amateur songwriter and Marketa Irglova the young immigrant girl who sang with the voice of an angel. Hansard hires out street musicians to be his backing band for a one day recording session, and the film follows the two leads for just a few days as they play each other their songs, and subtly fall in love. The original music in this film inspired a best selling soundtrack album, and won an Academy Award for Best Song (the track “Falling Slowly”). It’s a short lived date with destiny, as the two seemed fated to meet each other, and just as quickly to part ways. But for the pure and simple clarity of purpose, this movie is at once uplifting, inspirational and sincere, without the slightest trace of cloying sentimentality. Perfect. "Well, I was just about to go to bed." A gloriously bouyant romp you’ve probably never heard of, but it’s about time you did. One of the earliest full scale musicals in the vein of the Broadway shows, with the cast singing to advance the story ala the later MGM classics. But done to perfection here, with an exuberant and creative directorial style like very few films to ever come out of this era, and joyous performances. It’s a definite must-see for musical fanatics, and one of my personal favorites. Set in a WWI era Paris, with French star Maurice Chevalier as a romantic, swooning tailor who falls for a real life princess (Jeannette MacDonald). Scored by Rodgers and Hart, and includes their classics “Love Me Tonight,” “Mimi,” and “Isn’t it Romantic.” The movie is a fast paced jubilant fantasy filled with jokes and double entendres (practically the earliest prelude to spoofs like The Princess Bride or even Moulin Rouge), along with lovely musical interludes and an inventive visual atmosphere that manages to throw in such surreal touches as talking statues, three magic sorceresses, and horses that can outrun trains. Mamoulian hangs every thread together with a light comedic touch and the idea that it all exists in the magical, mythical France of storybooks and fairytales, where anything is possible. Watch for the opening sequence that inspired a thousand future opening sequences, from My Fair Lady to Beauty and the Beast.